A car’s suspension system is complicated, especially for those who aren’t mechanically inclined. It gets even more complicated when you consider that there are many different types of suspension systems, each with their own types of issues to watch out for. Read on to learn more about trailing arm suspensions systems and the issues to watch out for. What is a trailing arm? A trailing arm is part of a vehicle’s trailing-arm suspension system. If your vehicle uses a different type of suspension system such as leaf spring, double wishbone, or multi-link suspension, you don’t need to worry about it! The trailing arm is the piece of the suspension system that connects the vehicle’s axle to its chassis. In addition to the trailing arm itself are the trailing arm bushings. These are rubber or polyurethane components that act as cushions and reduce friction between the suspension parts. Trailing arms themselves are fairly resilient and don’t often wear out. However, the bushings can wear out or get damaged over time. If these are not replaced it can result in damage to the actual trailing arms. Clunking noises from the rear axle – You never want to hear clunking noises coming from your vehicle. If you’re noticing them from the back of the vehicle when you drive over bumps, accelerate, brake, turn, or put the vehicle into reverse, your trailing arm could be the issue. The worst the problem gets, the louder the clunk will be. Take your vehicle in to get inspected the moment you notice something sounds good to prevent further damage. Your vehicle won’t stay in a straight line – Worn bushings or a broken trailing arm can cause the rear axle to move independently from the chassis. This causes vehicles to sway, as the rear wheels may actually change the direction of the vehicle. Your rear tires are wearing unevenly and excessively – While it’s true tires naturally wear slightly unevenly (this is why tire rotations are important), if you notice significant or accelerated wear, you should have your vehicle looked at. A broken trailing arm or worn bushing can send your suspension system into misalignment, which alters where the vehicle’s weight sits. Ultimately this leads to premature tire wear. Your vehicle is shorter on one side – Your vehicle sits relatively level. If you notice that one side is even an inch or so higher than the other, it’s a good indication that there’s an issue with the suspension system. In the case of a trailing arm issue, worn bushings can allow the rear springs to lift, thus altering the height of the vehicle. 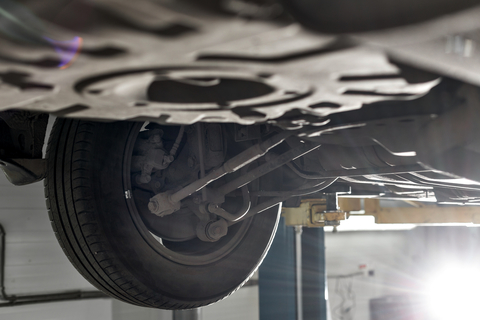 The suspension system is a crucial component of your vehicle. It’s important to have your vehicle checked out immediately if you notice an issue in order to prevent further issues or damage. Contact Park Muffler and set up an appointment today!